The Baltinglass officials attempted a solution by recruiting Dr Hartigan who had been acting in the Kiltegan district on the basis that he would be paid five guineas per week. However their local initiative was scuppered by central budgetary concerns when the Local Government Board based in the Custom House, Dublin wrote to say it would not sanction payment higher than four guineas per week. Thus an absent moon in Newbridge and an absent doctor in Baltinglass animated the Leinster leader readers of Easter exactly a century ago. An article on Newbridge in 1907 by Liam Kenny from his column in the Leinster Leader, 'Nothing New Under the Sun.' Our thanks to Liam. Local History enthusiasts may be interested in going on a historical walk in Leixlip during the town's annual whit-weekend festival (31st May to 4th June). Clane-born, Conor O'Brien, Leixlip-resident for half a century, will be conducting a historic walk on Friday, 1st June, 2007, starting at 7pm. There is no charge. The walk will commence at the Scouts' Den (formerly an early 18th century 'penal' chapel) opposite the RC Parish Church on Station Road, Leixlip; there is ample parking in the church (public) car-park. Conor's talk will take in the Guinness connection with Leixlip, where they had their first brewery. The Hon. Desmond Guinness has his home at Leixlip Castle for over 50 years. It will end at the Toll House, on the Liffey Bridge of Leixlip. Full particulars of the Festival Events are on the web, and contact may be made via leixlipfestival@eircom.net, tel 01 6243085. CRAFT FAIR - BOLAND’S YARD. SECOND COUNTY KILDARE BOOK FAIR! The second County Kildare Book Fair will take place on Sunday afternoon on the 3rd June in Kildare Town. This will be an opportunity for those interested in Local History and heritage as well as the general population who are interested in books and reading in general to visit a Rare Books Fair outside of Dublin. It is being organised by the Local Studies, Genealogy and Archives Department of Kildare County Library and Arts Service in conjunction with Kildare County Council and Lyonshill Books. According to Local Studies Librarian, Mario Corrigan, "there is an enormous interest in Dublin and other areas in this sort of event and after the success of the first ever County Kildare Book Fair in November last year we in County Kildare have the opportunity to have one locally. It is an ideal opportunity also for anyone who has not yet visited the new Kildare Retail Outlet Village to come to the town and see what is on offer." The event is free and open to all and will allow people to browse the books on offer in two different venues - The Kildare Heritage Centre and The Kildare Parish Centre. "The idea behind the two venues is to encourage people to walk through Kildare Town, visit Kildare Cathedral and thoroughly enjoy the day," said Mario Corrigan who has recently published a Sli na Slainte and Heritage Trail of Kildare Town and is anxious that people enjoy the experience that Kildare the Heritage Town has to offer. This year for the first time there will be the added attraction of a Walking Tour of Kildare Town at 1 p.m. – places can be pre-booked through the Heritage Centre. Eddie Murphy of Lyonshill Books is delighted to be able to add County Kildare to a growing list of Book Fairs that he and his colleagues have orchestrated. "It is an immensely pleasurable experience, whereby people can browse the stalls and hopefully with this new initiative in Kildare Town take in some of the rich heritage of such an historic setting - maybe pause in the local shops or the local cafes and pubs for a coffee and even visit the Outlet Village for a unique shopping experience. We do hope this year proves to be as successful as last year especially when we consider the weather last November was particularly awful and yet we had a great turn out," said Mr. Murphy. So why not take an afternoon break on Sunday 3rd June and come to Kildare Town to the County's Rare Books Fair - maybe in search of a unique gift or just to amble through the historic streets and enjoy the experience. Why not enjoy the unique shopping experience that is ‘Kildare Retail Outlet Village,’ and Kildare Town Heritage Centre has a host of collectibles and gift ideas to wet you appetite. As well as book dealers and local authors, The Kildare Archaeological Society, Kildare Federation of Local History Groups, the Grey Abbey Conservation Project and Cill Dara Historical Society will hopefully have information on their organisations and activities on display for people to view. The Kildare Classic Car Association will be on-hand as Sunday 3rd June is the date for their annual Gordon Bennett Commemorative Rally and the cars will be parked on the Square during the afternoon. It is planned to have a Craft Fair on the same afternoon in a third venue – Boland’s Yard just off the Market Square. All in all it is an ideal day out and most importantly - it's free. THOUSANDS AND THOUSANDS OF BOOKS, RARE, ANTIQUARIAN AND LOTS OF BARGAINS - And FREE VALUATIONS !!! History (local & national), literature, poetry, sport, fiction and ephemera. 1704: Agmondisham Vesey assigned the village or hamlet called Allenswood, Cos. Kildare and Dublin, this year to William Norman and John Dixon. [Sarsfield Papers: List of Deeds, 1414-1808, Deed No. 89: 56th Report of the Deputy Keeper of Public Records in Ireland]. A. Vesey, Senior, was Comptroller and Accountant General, Revenue Commissioners, as was his son of same name - Directory of Dublin, 1738. 1707: A Bill was introduced in the IHoC to make the age of consent to marriage 16 and 14 years for males and females, respectively. 1707: 6 Anne c19, Irish Statutes: An Act to preserve Bishop Narcissus Marsh's public library for ever in St. Sepulchre's parish, St. Patrick's Close, adjoining the Bishop's Palace (now Kevin St. Police Station). 1709: A lease of the townlands of Kilmacreddock to John Colman of the Parish of St. Martin's in the Fields, Co. of Middlesex. [Castletown Papers, box 36, IAA]. Was he an absentee landlord? I have found no other reference to him. 1710: On 4th June, John White Esq., a minor, of Leixlip, petitioned the House of Commons to enable him to sell or mortgage his estates to pay his younger brother and sister and other debts [HoCJ, Vol 2, p600]. Within a few days, on 10/6/1710, his wife, Mary, alias Purcell, sought control of her own lands and debt and money due to her (p.654 ibid). On the same date John's guardian, Lieut-General Sankey and Mary White petitioned the Commons for leave to bring in heads of a Bill in pursuance of an agreement between the parties (separating?) in relation to Mary's estate. The House ordered, as requested, that Messrs Conolly, Campbell and St. John Brodrick prepare the bill and that they further take into account a petition by Mary and her Father, Nicholas Purcell, that she be discharged from proceeding further on the said petition. (p.662, ibid) Six Campbells were listed in the Directory of Dublin 1738 at different addresses; a clothier, grocer and stationer denominated. 1710: The estimated population of Dublin was ~70,000, of which ~40,000 were Protestant. Those who were freemen of the city are catalogued [Gertrude Thrift, Dublin City Assembly Freedom Rolls, R/1/05/08, Dublin City Archives]. 1711: The Irish Linen Board was established. Linen, wherever it was made, had to be brought to the Linen hall in Dublin to be sold. 1711: Lease Book from Castletown Estate (Castletown Papers, Box 59, No 14, IAA) notes that a lease made on 16/8/1711 by Jas Marriott to Ben. Reyner provided for 'Machfield' [sic]. It noted that Mr Proby pays £5 rent; 7 acres. A manuscript copy of the lease with Benjamin Rayner, of Leixlip, Innholder, is to hand; it is part of the deeds belonging to Marshfield House. Anecdotal evidence suggests the existence of an inn on Black Avenue, to the rear of Marshfield; this may have been Rayner's. [aka Raynor]. Benjamin Rayner had a daughter, Catherine, born 10/7/1710; A Catherine Rayner was buried, 24/8/1711, in St Mary's graveyard, Main St, Leixlip. 1712: Confirmations carried out in St Mary's on the 6/5/1712 included: Mary and Elizabeth Bolan, and Bartholomew and Robert Raynard. c1715: Alexander Noble, working as a clockmaker at Lisnoskaugh [Lisnaskea] this year. Probably direct descendant of William Alexander Noble of the Toll/Bridge House, Leixlip, who died 1879 at Morphy House, nr Lisnaskea. [Wm Galland Stuart, Watch and Clockmakers of Ireland, Dublin 2000]. Mary, b. 17/6/1727 and Hestor, baptised on 10/10/1730 in Lucan. Did Robert move off the Leixlip site to live in Lucan before work on the bridge started? It seems so. Sarah Ingham of Lucan married John Quay, 9/7/1736; she was aged 16. William Ingham and Margrat Brown were married, 23/7/1746 (presumably at Lucan or Leixlip); William would have been nearly 24 years old. Robert's son, William, had in turn another large family: John, who was born in Corgorfin, Aberdeenshire, North Brittain [sic], but baptised in the parish in 13/11/1750; Catherine, baptised, 11/8/1754; William, b. 23/12/1755; Sarah, b.10/5/1758 and Robert, b.23/7/1759 - all the latter born in Lucan. A William Ingham - we're not sure whether it is the grandfather or grandson of that name, who was on his death in 1777, described as a linen printer residing at Palmerstown, Co. Dublin. A John Ingham and Jane Robinson obtained a marriage licence in 1730 [Deputy Keeper's 26th Report]. Several Robinsons from the 18th and 19th c. are buried in St Mary's graveyard. 1717: Stephen Costilloe or Costello, of Dublin, gentleman, and Agmonisham Vesey, of Lucan, agreed that the former could have navigation of the river Liffey from Dublin to the bridge of Kilcullen [Sarsfield Papers, nos. 126 & 127, List of Deeds, 56th Report of the Deputy Keeper.] There's also a reference in a lease on the mills at Leixlip which refers to access on the mill race "up to Costello's works". 1719: On 24/7/1719, [ HoCJ, Vol.3, p198.] is reported that a petition of Stephen Costelloe [sic], Gentleman, praying this House will take into consideration his great trouble and expense in making surveys and estimates of several rivers .. in order to [make] a navigable communication.. - was read and referred to the Committee of Supply. There is a reference in one of the deeds relating to the mills of Mill Lane, Leixlip, or the Bridge/Toll House of a right of access to the millraces "up to Costelloe's works". This is he.. Costelloe also had an influence in the advocating of the development of the Royal Canal many years later. c1720: Sir Richard Steele (1672-1729), founder of the Tatler, a Dubliner, friend and school mate of Joseph Addison (1672-1719), flourished. [Adrian MacLoughlin, Guide to Historic Dublin, Dublin 1979, p206] Another Sir Richard Steele, perhaps a relative two generations on, may have lived in the Glebe, Leixlip, or the previous building on this site, Glin's tenement. 1722: Richard Guinness (c1685- c1767), Arthur's father, was agent, ie land steward, for Dr Arthur Price, vicar of Celbridge and Canon of Kildare, who lived at Oakley Park (= St Raphael's), Celbridge [Patrick Guinness, millennium paper]. Price was also William Conolly s chaplain and a favourite. His father, Samuel, had been vicar of Celbridge before him. Arthur Price was promoted to Archbishop of Cashel in 1744. 1723: 10/10/1723, HoCJ, Vol 3, p331: Stephen Costilloe [sic], on his own behalf and other proprietors for making the Liffey navigable, was presented to the HoC and said that he had proceeded a good way in carrying out the navigation of the Liffey, and would have near finished the same, were it not for some proprietors not subscribing what they said they would. The works therefore suffered much and if the House supplied funding it would be made completely navigable. The House divided 92 for, 31 against. Mr Agmondisham Vesey was a teller for the 'yeas'. It was referred to the Committee of Supply. 1724: Confirmations at St Mary's, Leixlip, on 1/7/1724 included John Barton, Ann Bolan, and Honorita Ransfoord. 1728: Confirmations at St Mary's on 22/7/1728 included George Simmonds and Samuel Pechell. The Simmonds family lived at Collinstown. Daniel Simmonds was a member of the Turnpike Commissioners and had offices at Clare Street, Dublin. August 1731, who came to live in Leixlip after the death of his uncle on 30 October, 1729, in his Capel Street, Dublin, residence. Speaker Conolly was born in Ballyshannon, Co. Donegal about 1662. He was elected to parliament in 1715 and he was made Lord Justice in 1716. His Capel St residence was more or less where the Debtor s Prison was at Bolton St end. [See Lena Boylan s History of the Conolly family.] Speaker Conolly left all his lands, manors and tenements in Co. Kildare to his widow, Katherine (nee Conyngham), and after her death (in 1752) to his nephew, who had directly inherited Speaker Conolly's estates in Dublin. His executors were his wife, nephew, Arthur Price, (later Archbishop of Cashel, who d. 30/7/1752 and who is buried in St Mary's) Marmaduke Coghill and Thomas Morlay. [Conolly Papers, TCD includes a short history of family]. Wm Conolly's town house was at Capel Street, Dublin. His widow was residing there in 1738, according to the Directory of Dublin, 1738. Arthur Price (Pryse) was schooled at TCD from 2nd April,1696, at the age of 17. His father was Samuel Price, a clergyman, and he was born in Dublin. He was awarded a BA in 1700 and a D.D. on April 16, 1724. In Watson's Almanack of 1735 he was Bishop of Meath and by the 1742 edition he was a member of the Privy Council in Ireland. He was Vice-Chancellor of the university in 1748 and later Archbishop of Cashel. Marmaduke Coghill, S.C., was born in Co. Dublin and entered TCD on 30th March, 1686/87 when 16 years old. He graduated with a BA, LL.B., and LL.D. He was a judge of the Prerogative Court [Watson's Almanack, 1735 to about 1743], member of the Privy Council, MP for Armagh in 1692- 1703 and one time Chancellor of the Irish Exchequer. Speaker Conolly's nephew, the Rt. Hon. Wm. Conolly, was elected an MP in 1727, and served for 27 years until his death on 3 January, 1754. He married Anne Wentworth in 1733 and their only son, Thomas Conolly, married Louisa Lennox in 1758. Watson's Almanack, 1735 to 1744+ has him as Cursitor in the Court of Chancery; this Wm Conolly lived at Dunsink [Directory of Dublin, 1738, Dublin Corporation, 2000]. Lease to John Peppard of 29 years from 25/3/1714 at a rent of £23 - 2 - 0 p.a. Ditto to Robert Ingham for 3 lives at £17 - 14 - 6 p.a. Do. to Robert Dowan for 31 years from 25/3/1724. "A lease to Dennis Bollan of the Salmon Leap Inn for 31 years from 25th March 1713 at £7 - 7s per annum". Robert Dowan had a daughter, Catherine, baptised on 2/7/1710 in the parish; she, or a namesake, died and was buried in St Mary's on 24/8/1719. He is probably linked to Downes Bakery, Ballsbridge, Dublin. Dennis Bolan had at least two daughters, Anne and Catherine, baptised 21/7/1710 and 18/7/1715, respectively and a son, John, whose death and burial "in his father's toomb [sic] in the churchyard of Leixlip" is recorded on 22/6/1723. 1728: On 28/10/1728, Jeremiah Gleydhill, Inn holder, of Leixlip, Co. Kildare, did assign to James Nugent, Esq., of Tulchan, Co. Westmeath, for the sum of £76, the Salmon Leap Inn. [Registry of Deeds Memo No 57-514-39515.] The King's Inns Admission Papers list many Nugents of Co Westmeath in the legal profession, some connected with Lord Westmeath, in 1674. Gleydhill had a son, of the same name, baptised on 22/8/1729 in St Mary's, Leixlip. which there's a reference to a lease of 22/8/1723 from John Whyte to Hulda Brazill, widow of John Brazill, deceased, Inn holder - [perhaps the Ryevale Tavern?]. [Castletown Papers, box 75, IAA] A memorial of this lease is at the Reg. of Deeds, ref. 38-436-24908; it was for lands formerly held by Patrick Brazil, Innholder, and the lease was for 31 years at a rent of £20 sterling. Patrick Brazill is the father of Matthew Brazill, [baptised, St Mary's, 28/4/1709] of Leixlipp [sic] who died intestate in 1723. John and Hulda Brazill had twin sons, Stanly and Patrick, baptised 25/7/1721, at St Mary's, Leixlip. Robert Ingham's father or son, William Ingham, of Palmerstown, Co. Dublin, linen printer, died intestate in 1777. Probably the son, as the father had married in 1679 and would have been long dead by then. 1728: Indenture between John Whyte of Leixlip and John Usher of Dublin City re the mills at Mill Lane, Leixlip; Whyte was indebted to Usher. [Castletown Papers, box 75, IAA]. Us[s]her was related to the Molyneux, later tenants of the iron mills; a letter of 22 October 1726 from Christopher Ussher to his father speaks of Samuel Molyneux as 'Cousen Molyneux'. [Letter quoted in JKAS, Vol X, 1922-1928, p.196] Christopher Ussher lived at Smithfield; he was clerk to the trustees of the Linen Board, Molesworth St - Directory of Dublin, 1738. House, Parke [sic] and new House, ........................................£12 - 12 - 0. A Chronology of Leixlip 1700 - 1730 AD compiled by John Colgan. Our thanks to John. 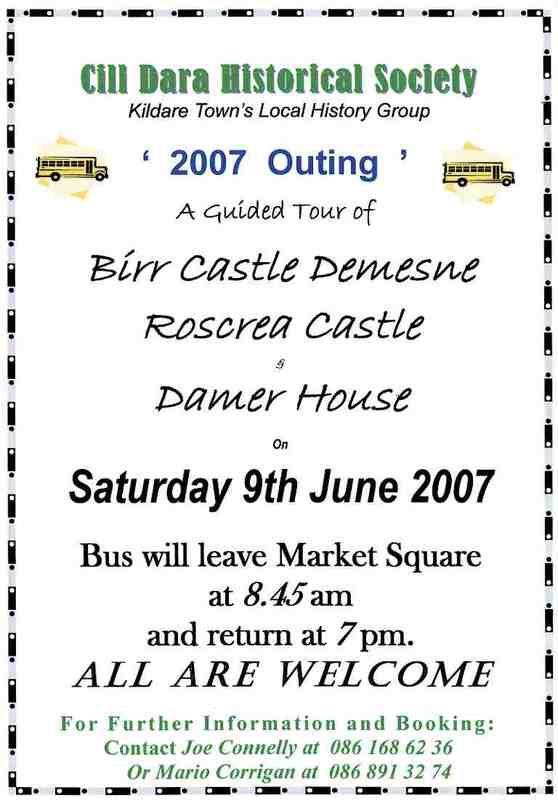 Details of the Cill Dara Historical Society Outing for Sat. 9 June 2007 to Birr and Roscrea - anybody interested should contact Joe Connelly 086 168 62 36. Historians from Carbury to Castledermot and everywhere in between will gather in Kilcullen on Saturday 26 May for the annual seminar of the Kildare Federation of Local History Groups. With over a dozen affiliated groups throughout Kildare the Federation gives locals involved in the history movement a chance to share discoveries and knowledge. The programme begins at 10am in the Kilcullen Heritage Centre where an array of Co. Kildare topics will be presented followed by an open forum. In the afternoon the participants will travel to Clongowes Wood College for a guided tour of the hallowed college and its castle orgins. This is the eight annual seminar run by the Federation and the event will be opened by Mayor of Kildare, Cllr. Fionnuala Dukes. Topics to be covered on the morning include the fascinating story of the Lock Hospital in Kildare by award winning historian Hugh Crawford; the old Naas Gaol by Brian Crowley and the story of Thomas Wentworth who commissioned Jigginstown Castle by writer and broadcaster Mae Leonard. For more information and registration contact Federation Secretary Larry Breen on 045 897445. The function of a paper is, to a large extent, to hold a mirror up to the community which it serves. Indeed a paper spends a great deal of its energies reporting on the interests of every other entity in its locality but rarely turns the spotlight to its own business initiatives. The Leinster Leader issue of 30 March 1957 could well be excused then for blowing its own trumpet to celebrate the introduction of an entirely new printing plant which positioned the Kildare paper at the forefront of print technology. The final stage of production for books and journals was the fearsome looking guillotine machine which could slice through reams of paper. The operator of this contraption was Liam Herbert. The description of the guillotine process explained that ‘the operator is protected from the automatically descending knife by an arm which pushes him out of range’! On that reassuring note the Leinster Leader staff members of 1957 displayed their new inventory of equipment to a readership which had remained loyal since the paper first published in 1880. Today, the premises at South Main Street, Naas, continues to be the heart of the Leader operation with the firm, despite many changes in personnel and technology, occupying the same business address for 127 years. Compiled by Liam Kenny from the rich resource of the Leinster Leader files, Local History Dept., Kildare County Library. Series No.9. Election drama as Kildare goes to the polls – a half century ago. The recent debate over electronic voting centred, at first glance, on concerns that the technology did not sustain the kind of trust that a voter needs in the mechanics of the election process. But it was hard not to conclude that there was great sentimental attachment to the time-honoured way of running Irish elections where the drama of the long counts has become a kind of national institution. And in a matter of weeks there will be another instalment of election ritual when the nation goes to the polls for General Election 2007. Fifty years ago there was certainly no shortage of electoral drama in count centres throughout the nation and none more dramatic than the Kildare constituency. Four candidates had contested the 1957 election in the three seat constituency. Bill Norton of Labour, Ger Sweetman of Fine Gael, and Tom Harris of Fianna Fail were the sitting candidates. The outsider was the second FF candidate, Patrick Dooley from Athy. The close nature of the contest was evident from the fact that all four candidates polled within 700 votes of each other out of a total valid poll of 26,769. Bill Norton reinforced the strong Labour tradition in the Kildare constituency by topping the poll and exceeding the quota. Also over quota on the first count was Patrick Dooley who had clearly mobilised wide support across south Kildare against the sitting trio who were all clustered around Naas. This was to be the major story from the Kildare constituency, the newcomer from south county overtaking his FF party colleague Tom Harris who was an institution in Kildare politics. But for a moment it looked as if an even more dramatic political outcome was to unfold with the possibility that FF might take a second seat at the expense of Fine Gael. As the count went on tension heightened among the tallymen with the margin between Harris and Fine Gael’s Ger Sweetman razor thin. The first count had begun at 2.30pm and continued until 7pm; Norton and Dooley were declared elected as stated. But all eyes centred on the ballot bundles of Sweetman and Harris which were differentiated by the narrowest of margins. The Leinster Leader’s election correspondent reported that ‘when the count was about to be resumed at 8.15pm, Mr. B.O’Mahony, election agent for the FF candidates, demanded a re-check and a re-count.’ At that stage there were only 29 votes between Sweetman and Harris. The recheck did not alter the order of the candidates so the returning officer, Mr. P J O’Neill, proceeded to the distribution of Norton’s surplus. Out of an even 400 transferable votes, the Labour man’s transfers went strongly to Fine Gael’s Sweetman dragging him above the quota. No doubt such magnanimity will be called for again as political futures are won and lost in the General Election about to happen fifty years on from those heady days of 1957.